This article is about intelligent species. For a list of non-sapient species in the Destiny universe, see List of animals. 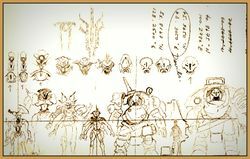 Concept art of five alien races (Vex, Fallen, Cabal, Hive, and an unknown race [possibly the Darkness], respectively). Size comparison of Vex, Fallen, Cabal, and human. Races are species that are either playable or enemies in Destiny.